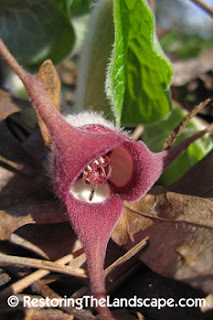 The Wild Ginger was in full bloom in early April this year. The three red sepals form a triangular shaped flower with a white interior. 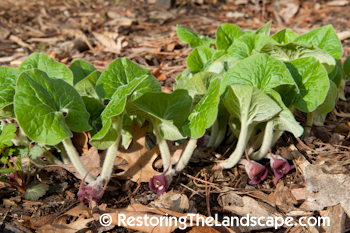 The flowers are hidden below the leaves and often rest on the ground. The method of seed dispersal is known however. 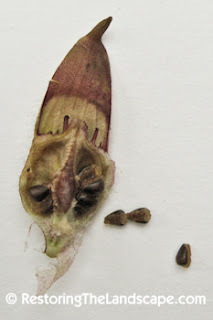 Along with other spring ephemerals such as Bloodroot, the seeds have a fleshy appendage attached to them called an elaiosome. The purpose of the protein rich elaiosome is to attract ants. 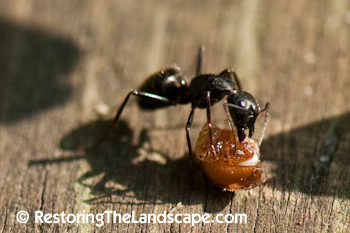 Ants love to consume the elaiosome, and discard the seed. They often take the seed back to their nests where the seed is discarded in their nest, ready to germinate the following season. I thought I'd see how much ants liked the elaiosome. 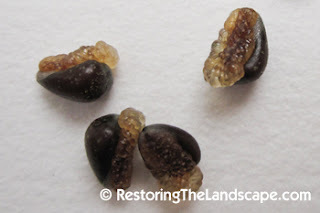 I collected a few seeds and placed them on the ground near an ant. 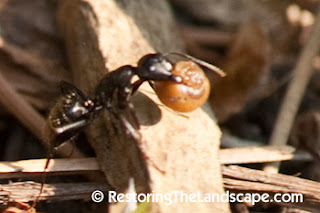 The ant was immediately drawn to the seed and elaiosome. It consumed the whole elaiosome from one seed, then carried the other one off probably to its nest. What a great method of seed dispersal, get the seed as far away as possible from the parent plant, and, away from predators such as rodents.